Slot Games listed are Golden Jaguar Casino from Cryptologic, Gushers Gold Slot from Rival Gaming and Geisha Story Slot from Playtech. 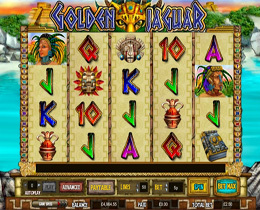 Golden Jaguar is a Video Slot game with a “Mayan” theme. The jaguar was a symbol of the Mayan people who inhabited Mexico, Guatemala, Belize, El Salvador and Honduras right up until the 9th Century. As you spin the reels you will hear the beating of Mayan drums. Players will be mesmerised by the animated icons, such as the Golden Jaguar, Mayan People, Masks, a Book and the high valued playing card. Collect 3 Scatters to activate 7 Free spins and get random multipliers up to 8x. Free Spins can be retriggered up to a total of 98! This recently released game from Rival has an oil drilling theme and includes all the typical icons such as oil rigs, drill bits, bundles of money, fancy cars, the Wild Oil Barrel and of course those lovely ladies that seem to be always around the” black gold”. It is a 5 reel 20 pay line slot and features multiple bonus features that they present three different pay tables. 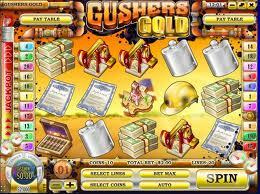 Watch as the Gushers Gold Jackpot Meter fills with oil. You'll win coins if the oil reaches the top and activates the red light. Get ready to drill for oil in the Gushers Gold Bonus Round when you hit 3 or more Drill Bit icons. Select your oil rig and choose your drill depth to search for oil and win coins. 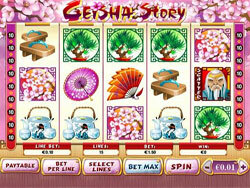 Geisha Story is a Japanese themed Video Slot machine game. Every time a coin is inserted it will enable another Pay Line. The high quality graphics and sound effects are amazing and feature a number of different symbols that help form winning combinations. This Video Slot game may be played for free or real money in values ranging from $0.01 up to $5.00 per pay line bet. Players may also wager 1 to 10 coins per line, with the maximum bet amount being $750.00 per spin. The maximum pay out in the standard Geisha Story slot game is 10,000 coins per line bet.